Breville VDF065 Halo Health Fryer better than the Tefal ActiFry? 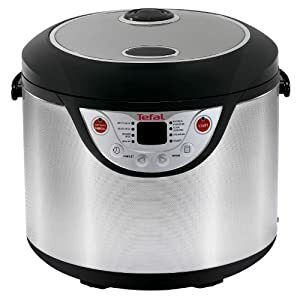 When we first created Foodshack, our very first product review was for the Tefal ActiFry FZ700215 Low Fat Electric Fryer and we loved it. So you can imagine how excited we got when the Breville VDF065 Halo Health Fryer was launched. Sadly in our opinion the Actifry is the better air fryer and are unable to give the Breville the same glowing review. On first look the Breville VDF065 Halo Health Fryer is better than the Actifry as you can cook a lot more in the Breville. Cooking cooking chips can be far from perfect due to a large percentage of them get damaged by the rotating arm when cooking, also the cooking time is a lot slower than you might expect, for example chips can take up to 35 minutes to cook. The Halogen lamp helps the Halo get hot quickly and the paddle turns them to help them get crispy but can be a little aggressive. The fryer also comes with a handy roasting rack for fish and chicken and works well. An advantage when using the Breville & the Actifry to cook chips and other fried foods at home is that your home will not smell of fried food. Another great advantage is that the bowl also turns. Because the fryer uses halogen lamps, it lights up the inside so you can see how things are cooking, which is not as simple with the Actifry. 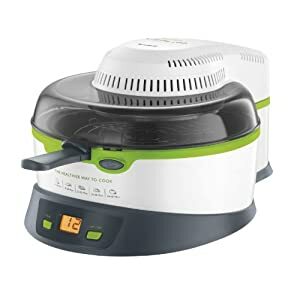 Even if you are on a Weight Watchers or Slimming World diet, you can still enjoy chips and other fried food when you use the Halo Health Fryer as you only need a spoon of oil you can cook 1 kg of chips. The instruction manual includes a selection of recipes, as the fryer cooks a lot more than chips. There are recipes for making various fish dishes, baked potatoes, crème brûlée and baked apples with butterscotch sauce. The Halo Health Fryer looks and sounds very high tec however it is simple to setup and use. 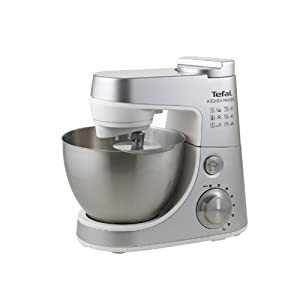 It is quite shallow and we cannot see how it could be used for baking scones, buns as you may well be able to do in a Halogen oven. The Halo only has one heat setting, so it is impossible to vary the cooking temperature and you can only vary the cooking time. On a positive note stays cool on the outside and is probably safer to use than a basic halogen oven. So what do we think? Well if you are looking for something to just fry chips and wedges then we would still use our trusty Actifry. If you have little space in your kitchen and are looking for a fryer & a halogen oven then the Breville VDF065 Halo Health Fryer is for you!